The iPhone is a global success story. And one of the reasons for this success can be attributed to the device’s support for more than 30 languages. But with the iPhone 4 update, Apple continues to push ahead on the global front. Multilingual Mac has documented these improvements, which include fonts that now display some Indic languages finally (though input methods are missing). But one improvement that I just picked up on — and it could have been added prior to iOS 4 — is the localization of “shortcut” top-level domain feature. Now I open the Mail app. Note below how when I press and hold the “.com” key that I get a nice range of ccTLDs and other top-level domains to select from. These domains vary based on my activated keyboards. 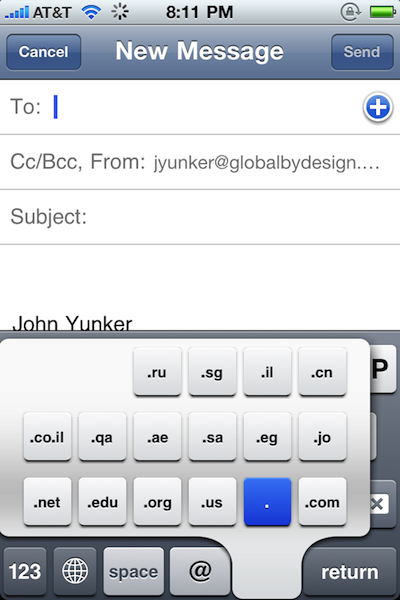 The more keyboards you activate, the more domains you have to select from. What other international improvements have you noticed with the new iPhone? 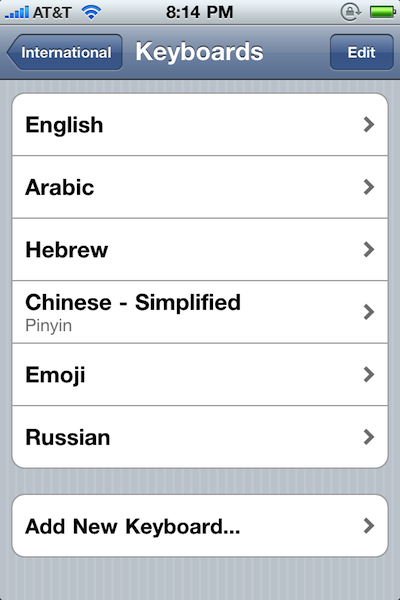 Good post about multilingual iOS. Thanks! I’ll be watching to see other contributions in the comments.